If your friend asked you how many cans of beer you can finish without getting drunk, how many would you tell him? 5? 8? Maybe you’ll say 8. Now, on your 7th can your eyes already became droopy, your cheeks are already blushing, you are already telling about your deepest secrets and before you take your 8th can of beer you already spewed. Your tolerance is up to 7 can of beers (at least in this example). There is a fine line between “appetite” and “tolerance”. For the example mentioned above your appetite tells you that you can take 8 cans but your tolerance tells you that you can only take 7 cans. This is same with in investing, your risk appetite is different and most of the time does not reflect accurately your risk tolerance. A lot of Filipinos today put their money in something they don’t really understand, in something they “thought” they already understand, in something that they have relied on the understanding of others (like asking and relying on answers from the social media). This is why a lot of Filipinos today get scammed. Your return objectives. The higher the return you require in order to achieve your financial goals, the greater the amount of risk you will need to take. Your age. The younger you are, the greater the amount of risk you can take. Why? Simply because you have more time to recover from any losses that you incur and because you have more income-earning years ahead of you. Your total assets. The larger your total assets, the greater the amount of risk you can take. This is because you have more to draw from for your regular expenses should you incur losses in some of your other investments. Your investment time horizon or the length of time you are willing to keep your money invested. The longer your time horizon, the greater the risk you can take. The reasoning behind this is similar to the reason behind age: the longer the time horizon, the more time to recover from any losses. Your past investment experience. This partly determines your attitude to risk. A bad experience from a past investment may make you more gun-shy and risk averse. Or, your past experiences could have helped you better understand the risk that each investment carries and could have made you more willing to take on risk. Your general attitude to risk. Other factors such as your personality or the people around you may influence your appetite for risk. The first 5 factors determine your ability to take on investment risk. These are the more objective determinants of risk tolerance. The last two determine your attitude towards risk and are obviously a bit more subjective. It’s important to understand the distinction between a person’s ability to take on risk and his attitude towards it. Sometimes, there are people who objectively can take on much more investment risk than they are currently taking but simply refuse to do so because they are just not comfortable with the idea of losing money. On the other hand, there are people who are willing to take on more risk even if they literally cannot afford to do so. Neither is ideal investor behavior. It’s always good to achieve a balance. 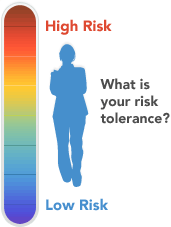 Understanding your risk tolerance then helps you determine which investments are suitable for you. Note: Above is an excerpt of an article posted in Philequity’s website. Understand more about “risk tolerance”. Learn more about stock investing, download PSE – COL Primer. Learn more about mutual funds and unit investment trust funds. Download my ebook about Pooled Funds.